Dr. Lenke is one of the key developers of the new generation of spinal systems called the CD HORIZON® SOLERA™ Spinal System. As the Next Generation System following the highly successful CD HORIZON® LEGACY™ Spinal System, which became the world’s most commonly utilized spinal implant system, the SOLERA Spinal System offers Next Generation advancement of spinal implant technologies. This includes advancement from two different types of rod materials in the LEGACY System— stainless steel and titanium—to a singular cobalt chrome rod system with a high-degree of versatility. With this new system, the four components of the LEGACY System can be streamlined into two components of the SOLERA System (SOLERA™ 4.75 mm and SOLERA™ 5.5/6.0 mm). This new system can make use more consistent, allow MRI evaluation post-operatively throughout the entire spine, and provide an increase in strength and stiffness with rod contouring properties that are ideal in spinal deformity surgery. 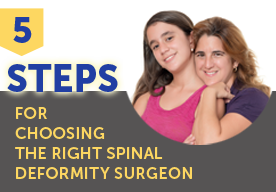 It is extremely important for spinal deformity surgeons to know the equipment they use intimately. Through the process of developing this complex implant system Dr. Lenke has abundant design and working knowledge of the intricacies of the SOLERA System and how it can benefit his patients.